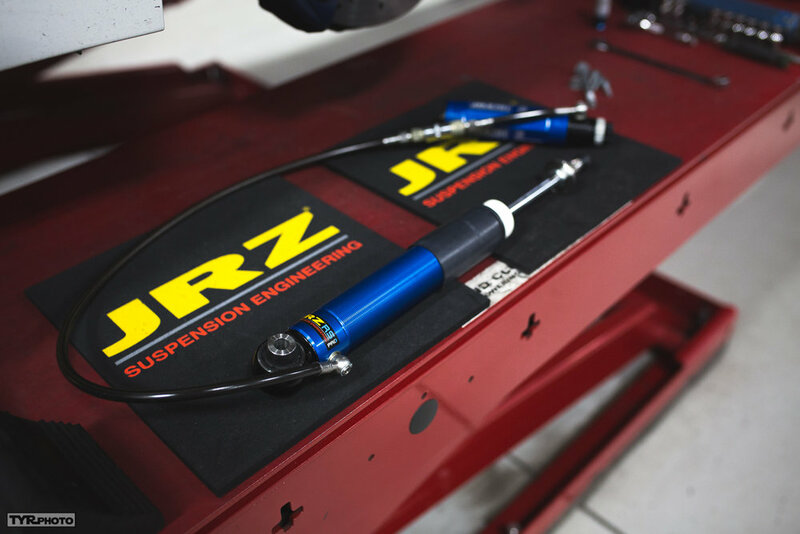 JRZ recently released “095 edition” dampers to commemorate the first-ever JRZ shock designed and developed by company founder, Jan Zuijdijk, back in 1995. The “095 edition” dampers are available in two trims: double adjustable as the RS PRO, and with the addition of low-speed compression as a triple adjustable shock in the form of the RS PRO3. Originally, the dampers were scheduled to arrive by November 10th; which would have left plenty of time for installation, setup, and some street driving before my scheduled track test date (November 25th) at Laguna Seca. However, due to unexpected supplier delays in the Netherlands everything was built and ready for shipping on Tuesday morning, November 21st. 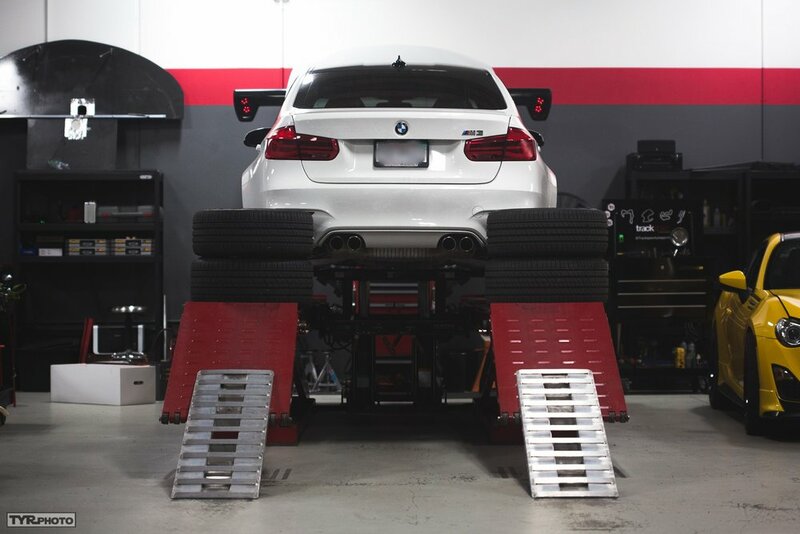 Fortunately for me, the team at JRZ were amazing about overnighting the dampers straight to Trackspec Autosports in Fremont, CA the very next day (Trackspec is an authorized JRZ dealer and installation facility). What I would be remiss in mentioning, is that right when my RS PRO3s were leaving the Netherlands I was coming down with a nasty stomach virus; one which would end up putting me in the local hospital emergency room, attached to an IV drip. But I was determined to get better and after staying there overnight, I was able to go home the very next day. Phew. So, that brings us to Wednesday November 22nd (the night before Thanksgiving). After an already long day of work, Jon Vo, Victoria Capinpin, and Son Vo stayed late (thank you so much) at the shop to help with the removal of my existing JRZ dampers (non-reservoir double adjustable RS TWOs) from “Betty.” After that was completed, we began the installation my new RS PRO3s dampers. I also want to give a shout-out to my friend, Graham Downey, who drove 90-minutes one way to come and help out. Graham happens to be a three-time national championship winning racing driver, and an expert at alignment and suspension setup. After the dampers were installed, we spent some time making sure the car was perfectly corner weighted before adjusting the alignment settings to our liking. Driving home that night, I immediately noticed two things. First, the RS PRO3s are significantly quieter than the RS TWOs over bumps; even though I am still using my JRZ Sport spherical bearing top hats (which are a bit “noisy” because, by design they have little to no “give”). Second, the RS PRO3s are much more comfortable out on the road (having control over low-speed compression makes a huge difference when it comes to ride quality and smoothness) even though I am still using the exact same spring rates (700lbs in the front and 900lbs in the rear). Saturday morning arrived, and on my way to Laguna Seca (which is about a 100-minute drive from my house) I couldn’t help but continue to be impressed about the comfortable ride characteristics of the RS PRO3s on California’s notoriously bad freeway surfaces. Cruising at 80MPH, most bumps were absorbed so well that they were barely noticeable. On this particular day we were testing during an open track event with local organizers, On Grid. We had a total of 4x 25-minute sessions. So, Graham and I decided to split the time evenly. I went out for the first morning session and wow, the dampers felt great right out of the box! I was immediately lapping in the low 1:41s (with an additional 200lb passenger) and “Betty” felt well-balanced and poised. Under hard braking, the front end stayed planted with zero dive. We collected tire temp data throughout the day and took notes about different characteristics as we made changes to rebound and compression (low-speed and high-speed) settings. 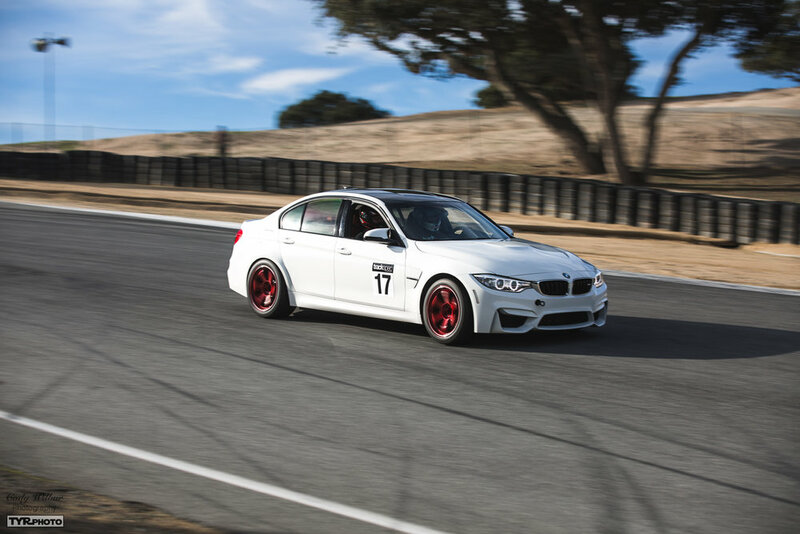 By the end of the day, Graham had recorded a new personal best for “Betty” at Laguna Seca: 1:39.2, which is nearly half a second better than back in August (with the RS TWOs dampers). We were both impressed by how the car felt noticeably “easier” to drive, and less “lively.” The RS PRO3s work so well that as a driver, I really don’t have to. And yet, I can still go under 1:40 at Laguna Seca in a car that I drive to and from work in every day; which is really moving (we saw Lateral G figures in excess of 1.8, and speeds of 126 mph down the front straight). Personally, I think these dampers have transformed my BMW M3 into what it should’ve been from the factory; it is now much more civilized every day, and much more composed on the racetrack. I couldn’t be happier. Special thanks to, Trevor Ryan (from TYRPhoto who also shoots for SpeedHunters), for coming and photographing the installation at Trackspec, and for taking awesome rolling shots of “Betty” at Laguna Seca.